Within each of the pieces at deJonghe Original Jewelry, there is a story. “The first thing when it comes to designing is inspiration. We’re bombarded with influences, especially today more so than years ago,” said Dennis deJonghe. The textures and forms of the ocean have always inspired him. Working only with natural stones, he said at deJonghe Original Jewelry they understand and carry a lot of diamonds, but Mother Nature forms such an amazing array of stones–from a lustrous pearl to a dazzling complex opal–that variety is always interesting. “When I’m designing my own pieces, there’s a freedom in the beauty of that and it’s very rewarding. When I’m working with someone else, the best results come when they know their tastes; they are very defined and know what they like,” said deJonghe. The first stone deJonghe ever set was a beautiful, jazzy tourmaline. Formed in many different locations around the earth, tourmaline ranges in color from pink to green and even comes in a unique bi-color watermelon. 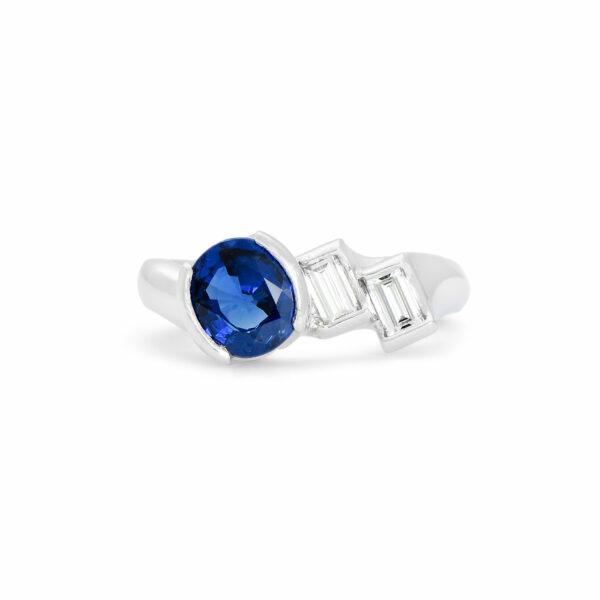 “Certain gemstones absolutely have certain properties that have been chronicled in books and folklore for years. Amethyst crystals are famous for this. Locally, there are the Gore Mountain garnets, and the Herkimer quartz. There can be a really soothing aspect for many looking at a gem. Real gem collectors want to touch and feel the stone. It’s very evident they are truly in love with what they’re working with,” said deJonghe. Gem dealers often just want to show off their prized finds. Gem cutters are creating electrifying shapes that are taking the jewelry world by storm, as well. It’s a phenomenon Dennis and his son, Evan deJonghe encounter regularly on the gem-searching excursions that lead them across the country. “Gem buying trips are always very exciting. I’m like a kid in a candy store and my son is the same way,” said deJonghe. This is when the most excruciating decisions must be made. “I’ll see something, and for some reason I have to have it. Then it sits in the safe for years,” said deJonghe. That’s what happened with a certain ammolite stone. It wasn’t until deJonghe saw it resting next to a Mexican opal that inspiration finally struck. “All of a sudden it hit me,” he said. 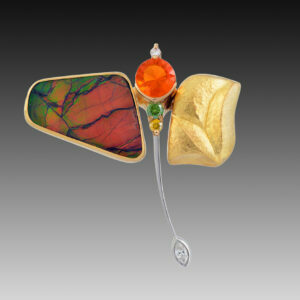 The abstract dragonfly pin he created containing the two stones is featured as an example of excellence in jewelry making and design in the March issue of the MJSA Journal. When Evan deJonghe found an unusually rare matching pair of large freeform rainbow moonstones, Dennis told his son to forget about them because they were too expensive. Peggy deJonghe, the store’s accountant, told her son to go ahead and get them. 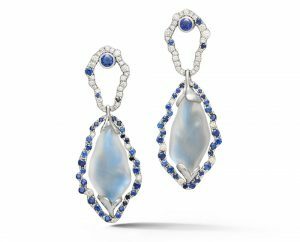 Team collaboration enabled the one-of-a-kind “Moon Gem Luster” earrings, set in platinum and accented with diamonds and sapphires, to emerge.